Documentation of Etudes from pi solo exhibition which hung in the foyer of Jenoptik AG corporation in Jena, Germany from April 17 to August 31, 2012. www.jena.de/sixcms/detail.php?id=108527? 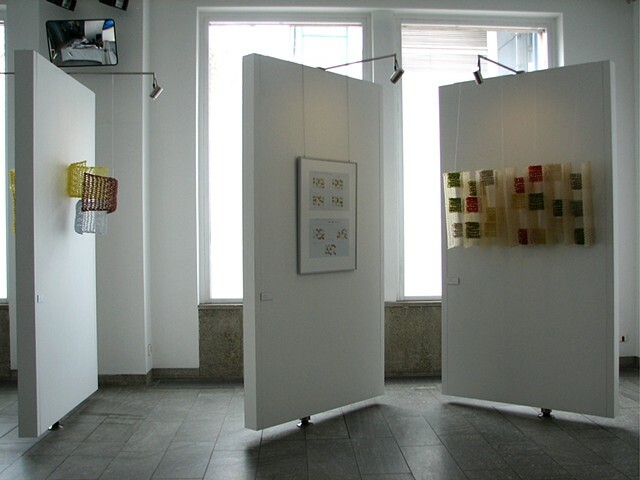 The exhibition space consists of 5 2-sided display panels from which we hung the 6 small sculptures created for the 2010 Berliner Liste along with working drawings for these sculptures mounted in 4 separate frames. For details of the small sculptures go to the Crocheted Fiberglass 2010 pages yvettekaisersmith.com/section/361280_20? In 2005, I created a large work for ARTexhibitionLink which showed in Rome and Berlin. During the Rome show, a video was made of me talking in front of that large work. Since it was not possible to nail into the walls at Jenoptik, the curators decided to project a loop of the video with no sound onto the large entry wall. Adjacent to the lobby is a small gallery that informs of Jenoptik's technology and accomplishments. Within one of the displays is the same video with sound. An article in focus Magazine of the Jenoptik Group about the exhibition, pages 28 - 31: www.jenoptik.com/internet_en_focus/%24F?